According to a 2008 analysis published in Science, over 40% of the world's oceans are heavily affected by human activities and few if any areas remain untouched. The DSCC is back at the United Nations headquarters to advocate for much needed deep-sea conservation measures. This week marks the 12th meeting of the ‘United Nations Open-ended Informal Consultative Process on Oceans and the Law of the Sea’. In UN-speak, the annual meeting referred to as ‘UNICPOLOS’ or ‘ICP’. ICP takes on a particular theme each year, and this year that theme is the June 2012 UN Conference on Sustainable Development (or Rio+20), possibly the most influential global environment conference this decade. The Rio+20 meeting has the potential to bring all 192 member states of the UN together to take decisions how we can sustain the well-being of our planet and ourselves. The original Rio Earth Summit (or UN Conference on Environment and Development) resulted in (among other things): the Rio Declaration on Environment and Development, the Convention on Biological Diversity, and the Framework Convention on Climate Change. The challenge, however, is that the focus of Rio+20 has not yet been decided. As BBC correspondent Richard Black writes, it is a ‘big summit’ in search of a ‘big idea’. The DSCC and the rest of the ocean community believe that big idea should be the oceans. According to the preliminary findings of a major new report, the global ocean is "at high risk of entering a phase of extinction of marine species unprecedented in human history" as a result of overfishing, pollution, and climate change. 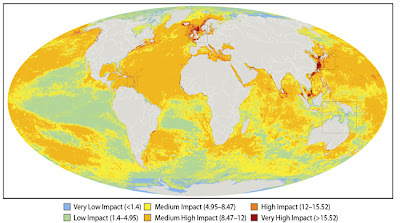 International waters – which cover 45% of the planet – are essentially open for managed exploitation. The main exception is international fisheries. They are partially managed in some areas of the world, but overall evaluations show them to be failing in their conservation mandates. The DSCC believes that the time has come for the world to tackle the serious and long-running threats to the marine environment. This week we will be looking to the ICP to ensure that the oceans are a high priority at next year’s summit. We will also continue to push our UN goals specific to deep-sea conservation this year.